The internet may be an international system of interconnecting networks sharing a rough global consensus about the technical details of communicating through them – but each country manages its own internet environment independently. As the U.S. debate about the role of government in overseeing and regulating the internet continues, it’s worth looking at how other countries handle the issue. Our research and advocacy on internet regulation in the U.S. and other countries offers us a unique historical and global perspective on the Federal Communications Commission’s December 2017 decision to deregulate the internet in the U.S. The principle of an open internet, often called “net neutrality,” is one of consumer protection. It is based on the idea that everyone – users and content providers alike – should be able to freely spread their own views, and consumers can choose what services to use and what content to consume. Network neutrality ensures that no one – not the government, nor corporations – is allowed to censor speech or interfere with content, services or applications. As the U.S. continues to debate whether to embrace internet freedom, the world is doing so already, with many countries imposing even stronger rules than the ones the FCC did away with. Before 2015, many internet businesses in the U.S. discriminated against or blocked customers from particular legal uses of the internet. In 2007 Comcast illegally blocked its customers from sharing files between themselves. In 2009, AT&T blocked access to Skype and FaceTime apps on its network. In 2011, MetroPCS blocked its customers from streaming Netflix and all other streaming video except YouTube (possibly due to a secretly negotiated deal). In 2012, Verizon disabled apps that let customers connect computers to their mobile data service. There were many other violations of the principle of net neutrality, too. Customers and regulators tried to control these discriminatory practices over many years of public deliberation and multiple court cases. In 2015, under the Obama administration, the FCC finalized the Open Internet Order, a set of rules barring internet service providers from speeding up or slowing down traffic based on its content or whether the companies posting it had paid extra to the company delivering the data. It was far from perfect – but nonetheless a giant leap forward. In early 2017, after his inauguration, President Trump appointed Ajit Pai, a former Verizon lawyer, as the FCC chairman. 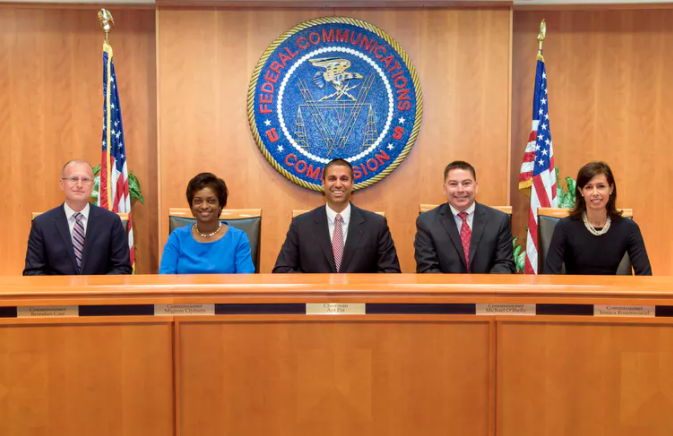 Pai, an Obama appointee to the FCC who had voted against the Open Internet Order in 2015, has moved rapidly to undo it. He and some other comentators believe that customers will get better service from a less-regulated market, ignoring that the rules only emerged in the wake of problems and consumer complaints. Other countries are facing similar dilemmas about how to deal with today’s digital realities, and are slowly and individually contributing to a patchwork of laws that differ from country to country. But many highly industrialized and rapidly developing countries share a general consensus that regulations ensuring an open internet are good for consumers and for civil society. Brazil’s Civil Rights Framework for the Internet, enacted in 2014 and further refined in 2016, only allows internet service companies to prioritize certain types of traffic for technical reasons – such as overloaded networking capacity – or to allow network use by emergency services. Yet, the country has been reluctant to enforce these rules and hold violators to account. Much like in the U.S., there is increasing concern that industry power has overwhelmed government regulatory agencies. Some of the largest telecommunications companies have been providing their mobile internet customers with preferential access to content on sites and services owned by business partners. Many Brazilian consumer rights groups are particularly alarmed because the companies receiving this privileged treatment are all large foreign corporations, including Facebook, WhatsApp, Twitter and music-streaming service Deezer (the only non-U.S. company). In addition, there are proposals in the works that would grant tens of millions of dollars in publicly owned telecommunications infrastructure to private companies for free. Brazilian internet freedom is further at risk because the country’s telecommunications companies are planning to insist that its regulators align with the weakened U.S. rules. The European Union approved strong rules in 2015, requiring companies that provide internet access to handle all traffic equally, leaving flexibility to restrict traffic when network equipment was operating at its maximum capacity. EU rules also allow traffic restrictions to protect network security and handle emergency situations. In 2016, European Union electronic communications regulators detailed potential problems in agreements between telecommunications companies and content providers. And they explained that quality of service could vary, but no specific applications should be discriminated against. In 2017, they highlighted the importance of Europe’s emphasis on proactively monitoring compliance with net neutrality rules, rather than waiting for violations to happen before reacting. This gives European residents much stronger consumer protection than exists in the U.S.
India has taken similarly strong steps. In 2016, the Telecom Regulatory Authority of India approved rules stating that “no service provider shall offer or charge discriminatory tariffs for data services on the basis of content.” In November 2017, the agency also issued “recommendations on net neutrality,” laying out rules of the road for internet service providers that incorporate substantial protections against content and application discrimination. Indian regulators are looking to balance consumer and corporate priorities in areas such as security, privacy and ownership of data. Moreover, they are considering adopting regulations to spur competition in mobile data services. Most importantly, Indian regulators make very clear that companies providing internet service should not do anything “that has the effect of discriminatory treatment based on content, sender or receiver, protocols or user equipment.” This puts openness at the core of internet service, the sort of clear consumer protection that public interest advocates and academics have called for. The U.S. internet industry is a powerful global force, with billions of users of its websites and online services all around the world. Further, the U.S. government has traditionally been a leader in developing policies that balance free speech, consumer protection and other civil rights with strong opportunities for research and business innovation – but this too is now in decline. Net neutrality protections might not be so necessary if the broadband market were more competitive. But 29 percent of Americans have no options for getting high-speed wired internet service at home. Another 47 percent have just one choice – and 20 percent have just two. The telecommunications industry continues to consolidate – though the U.S. Department of Justice is trying to block the pending AT&T-Time Warner merger. In this market with few providers, and many companies seeking profits by promoting their own content via their own networks, net neutrality protections will only become more important – not less so. Lastly, legally speaking, policy and regulatory decisions made in the U.S. don’t hold any direct power in other countries. However, domestic rules about the internet will indeed affect the global conversation around net neutrality. What the U.S. decides, through the FCC, the courts and potentially even through Congress, will determine whether U.S. leadership on the internet remains strong, or whether it will cede ground to other countries willing to protect their citizens.